2. Cut the eggplant into thin slices and chop the peeled tomatoes. 3. Heat 3 tablespoons of oil in the pan and fry the slices of eggplant all dente and put them a side. 4. Heat 1 tablespoon of oil in the pan and fry the ground beef and add the spice mix to the beef. Then add the tomatoes. 5. 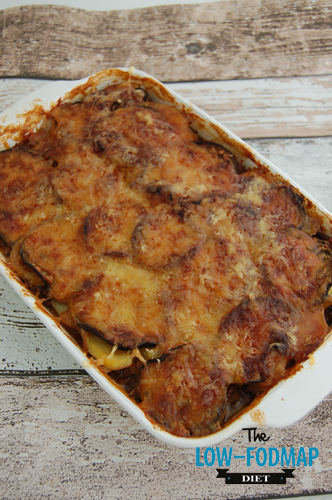 Grease a baking tray with oil and full up with a layer of the beef mixture, followed by a layer of potatoes and a layer of eggplant slices. Repeat until everything is in the tray, make sure you end with a layer of the beef mixture. 6. Make the sauce: Make a roux of the oil, buckwheat flour and rice milk. Use a pan with a thick bottom. Heat the oil on a middle heat. Add the buckwheat flour and fry this for 2 minutes. Then add half of the rice milk. Mix well with a whisk until the lumps disappear. Now add the rest of the rice milk until your sauce is thick enough. Flavour the sauce with the nutmeg, pepper and tomato juice. 7. Add the sauce to the oven try. At last, you add the cheese on top. 8. Put the moussaka in the oven for 40-50 minutes. The sauce is a little bit watery when it comes out of the oven. Don’t worry, this is normal! The sauce don’t contain gluten to thicken the sauce, but it is enough for the flavour and it makes the moussaka more creamy.